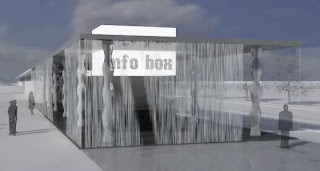 "The Digital Water Pavilion is an interactive structure made of digitally-controlled water curtains and will be built at the entrance of the 2008 at Zaragoza. The "water walls" that make up the structure consist of a row of closely spaced solenoid valves along a pipe suspended in the air. The valves can be opened and closed, at high frequency, via computer control. This produces a curtain of falling water with gaps at specified locations - a pattern of pixels created from air and water instead of illuminated points on a screen. The entire surface becomes a one-bit-deep digital display that continuously scrolls downward."